Petite Indulgence / Cooking and other Adventures: "Riz Casimir"
This dish is very popular in Switzerland and I loved eating this as a child, because it combined a nice mild chicken curry and the beloved sweet canned fruit, that we usually only got on special occasions as desert. Ah memories! Now let's start bringing those wonderful days back. Most of the prep-work for this dish lies with the chicken and curry sauce, for the rice you really don't have to do anything than just cook a plain white rice as the base of the dish. Mixed the two, so they are combined. Melt the butter in a large frying pan, and fry the chicken strips or cubes, to a nice golden brown until done, you might want to do this in two batches so the chicken cooks evenly. Once the chicken is cooked, remove it from the pan to an oven save dish and keep warm in the pre-heated oven. Melt a tablespoon of butter in a pan, add the curry/flour mixture and roast in the pan for about 1 minute only. Then pour in the chicken stock and the milk, whisking continuously until it comes back to a boil. reduce the heat and season with salt and pepper, add back the chicken and cook for an additional 10 minutes. In another small pan, melt a dab of butter and sautee the canned fruit for about 5 minutes, so they get coated nicely with the butter. 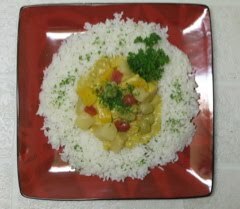 Place some of your rice on a warmed plate, add the chicken curry in the center of the rice and garnish with some of the sauteed fruit. Sprinkle with a little bit of parsley. Bon Appetit! En Guete! Mahlzeit! Buon Appetito! PS: Instead of canned fruit you can always use fresh, pineapple, bananas, peaches etc.